Life Insurance for my Parents: What Does Gerber Life Offer? Parents worry about their children. It’s a universal fact of life. In turn, children worry about their parents. Adult children often fret over their parents’ financial situation, especially in a shaky economy. One area of concern is life insurance protection. For example, when one parent passes away, will there be enough money for the surviving parent to live on? Whether your mom or dad passes away first, the surviving spouse may face financial challenges. Term Life Insurance: With Gerber Life Term Life Insurance1, your parents choose a level of coverage and a specific number of years, or “term,” for which they want to have that coverage. Term life policies are available at coverage amounts between $25,000 and $1,000,000. Terms can be 10, 15, 20 or 30 years. Your parents choose the combination of coverage level and term that best suits their budget and needs. Once mom or dad has purchased a policy, the premium will not increase for the length of the initial term. After the initial term, the policy can be renewed annually with guaranteed renewal and a premium based on your parent’s age at that time. Either or both parents may apply for a policy up to age 70. The Gerber Life Term Plan is not available in Canada. Whole Life Insurance: Generally, whole life insurance is more expensive than term life insurance, because it is intended to cover an individual’s entire life, not a fixed term. An advantage is that whole life insurance builds cash value. Your parents can borrow against the cash value if they need some money quickly. Also, they can also choose to turn in the policy for its cash value. The longer your parents hold the whole life insurance policy, the more money it accumulates. Coverage is available at amounts between $25,000 and $1,000,000, and premiums are guaranteed not to increase during the life of the policy. Your parents can apply for the Gerber Life Whole Life Policy2 up to the age of 80. Coverage is dependent on answers to health questions. If they are in good health and are under age 51, a medical exam is not required. If they are age 51 or older and want more than $300,000 in coverage, or if a medical exam is required for any other reason, Gerber Life will pay to have a specially trained person meet with them. Either or both parents may apply for a policy. 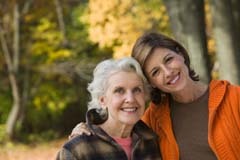 Guaranteed Life Insurance: If your parents are in the 50 to 80 age range, they may wish to purchase a Gerber Life Guaranteed Life Insurance Policy3. It provides between $5,000 and $25,000 in life insurance coverage (for South Dakota residents, maximum coverage is $15,000). Your parents will face no medical exams, and no health questions will be asked. They can’t be turned down, because acceptance is guaranteed. It’s a kind of whole life insurance that builds cash value. The cash value can be borrowed against if a need arises*. The Guaranteed Life insurance policy can enable your parents to put money aside for funeral or other final expenses and give them comfort in knowing that they’ve planned ahead to ease the burden for you. These three options, offered by Gerber Life, are great and easy ways to begin talking about life insurance with your parents or your spouse.